I am the Tenacious Blind Girl, aka Shell. 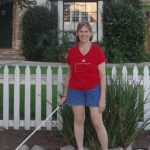 I am legally blind due to retinitis pigmentosa (RP) and permanently and physically handicapped by osteoarthritis, osteoporosis, fibromyalgia, renal impairment and a few other diagnoses. I wanted to create an online support group that was accessible for visually impaired and handicapable folks. My professional background is I am a Registered Nurse (RN) and was the Director of Medical Management for a large health network in Orange County, CA (Memorial Health System-MHS) until becoming permanently disabled after multiple orthopedic surgeries (osteoarthritis) and finally being diagnosed with RP. As Director, I wore both clinical and technical hats in the corporate healthcare world. My clinical departments included care management, health education, utilization management, care transitions and social services. My technical departments included regulatory compliance, quality improvement, clinical metric/data reporting and implementations of electronic health record and clinical information systems. I found myself looking for an online community that was accessible, active and user-centered. Even though I am the leader of an RP group on a large health board, I still felt like there was a better solution out there. So, I decided to create my own. I originally created Retinitis Pigmentosa Support (RPSupport.org), then it morphed into the Low Vision Support Group to encompass folks with all sight-stealing conditions. I should note that although I have a technical background implementing clinical information systems, I am not a web designer, coder, or anything else technical! After much research, i decided to build my site using WordPress. I love WordPress as it lets my inner geek come out and is so flexible. I admit, I have become a little obsessed learning how to make my site as accessible as possible for visually impaired folks. Now that the site is built, let’s grow the community. Okay that’s my WAY too long story! I am excited to see where our journey leads!